Arnica is a well-known homeopathic remedy and a gentle herb from the daisy family (a relative to Calendula, Chamomile, Echinacea, Yarrow and Dandelion). 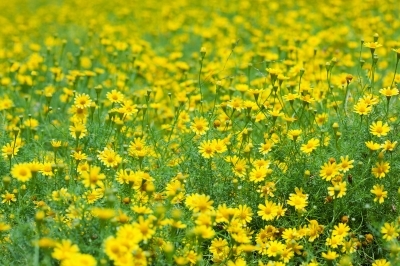 For centuries Arnica has been used for bruising and sprains. It’s old names such as “fall herb” and “wound herb” signify its age-old use for the effects of trauma. Swiss mountain guides chewed Arnica leaves to prevent fatigue from climbing. Just like the tough, hardy daisy, Arnica will help you bounce back from life’s knocks and tumbles. It reduces pain, inflammation and swelling, and increases blood circulation. Arnica is an alpine plant growing and thriving in the most extreme conditions, making it a tough, hardy plant. It grows in nutrient-poor soil, at high altitudes and strong sunlight. It is a survivor, getting through the most difficult of times. It’s leaves are also usually full of little insects and parasites, giving it a victim persona. Its root contains essential oils which are powerful anti–inflammatory agents. So there is no wonder that Arnica is a powerful remedy not just on a physical level but also on emotional and spiritual levels too. If you have fallen over and taken a knock, or are feeling battered and bruised from a tough exercise workout, Arnica knows that feeling. Arnica can sooth your weariness, heal your bruises, remedy the trauma and comfort your injured pride. Arnica Salve (by Neal’s Yard Remedies) is potent plant power in a jar: organic essential oils and herbal extracts in pure, organic beeswax. Supporting a hard worked body, the salve can be massaged into muscles before and after exertion, stimulating muscles before workouts and easing them afterwards. Of course it is also a necessity for the organic medicine cabinet for emergency first aid for those knocks, bruises, falls and sprains. When overtired why not enjoy a restorative soak with Arnica in the bath. Infusions of mineral-rich Seaweed, Comfrey and Arnica are combined with pure essential oils of Lemon, Pine, Juniper and Lavender to ease tired muscles and restore a sense of vitality. Especially formulated to ease weary limbs. Or why not try the new Seaweed and Arnica Bath Salts? Jackie Marsden MAR is a qualified reflexologist, acupuncturist, promoter of healthy living and independent consultant (Group Leader) for Neal’s Yard Remedies Organic.